Week three of the selfie course is about machine audiences for our selfies. Although most of us make selfies imagining other humans – or maybe just yourself – as the primary audience, our selfies are also viewed and interpreted by machines. Lev Manovich his team’s Selfiecity.net is a great place to start exploring what biometrics means for our online self-representations. They used biometric facial expression recognition to compare selfies from different cities around the world. Poke around the site a bit. 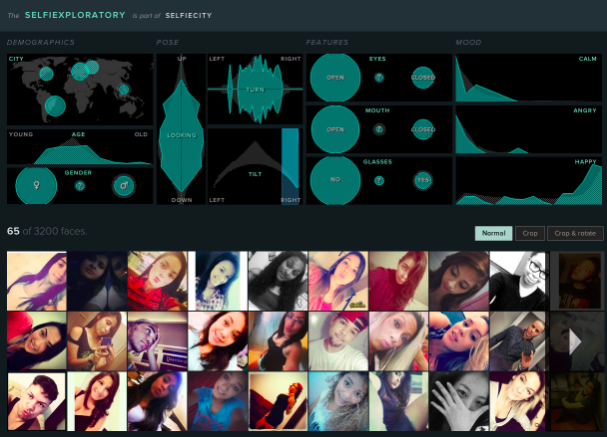 Use the Selfiexploratory to curate your own selections of selfies from their data. The “selfiexploratory” in Lev Manovich’s Selfiecity dataset allows you to make selections of certain kinds of selfies. Then, read Liz Losh’s essay critiquing the use of biometrics and querying what this kind of research can really tell us. 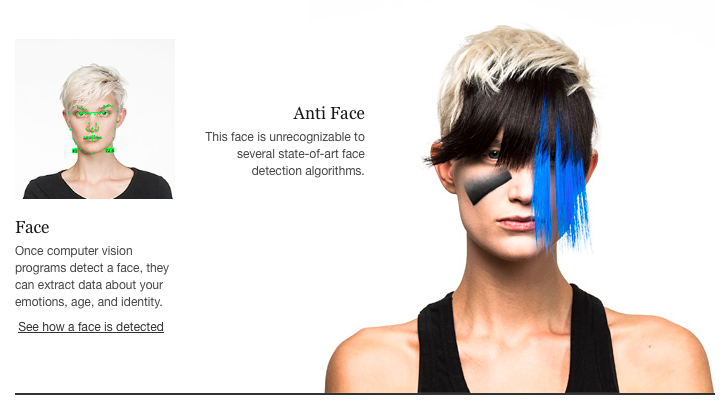 CV Dazzle is a design scheme including makeup and hair specifically designed to fool facial recognition software into not detecting a human face. makeup to make a human face unrecognizable to facial recognition software. Find one of the categories of biometric analysis (gender, age, weight, race, etc.) and shoot a photo that you think might “fool” a non-human audience member into interpreting you as different from the way you typically present. Photograph yourself in a way in which facial recognition software or similar techniques would not be able to identify as you, but that still expresses something meaningful about you. Please post the image(s) you take to our Flickr group along with a descriptive and reflective text describing the choices you made when taking the images. Why this image? How does this kind of self-representation work? How do machines see you differently to the way you see yourself? You can also comment on this blog post to take part in the discussions. Here is the full text of the syllabus for this week, including readings, discussion topics, image assignments and a reflection essay prompt. If you are following this course online, without being part of an existing class guided by a teacher, just focus on the image assignments. Professor of Digital Culture at the University of Bergen in Norway. Author of Blogging (Polity Press, 2008 and 2014) and "Seeing Ourselves Through Technology: How We Use Blogs, Selfies and Wearables to See and Shape Ourselves" (Palgrave, October 2014), and co-editor of Digital Culture, Play and Identity: The World of Warcraft Reader (MIT Press 2008). ‹ We are all? I am not?